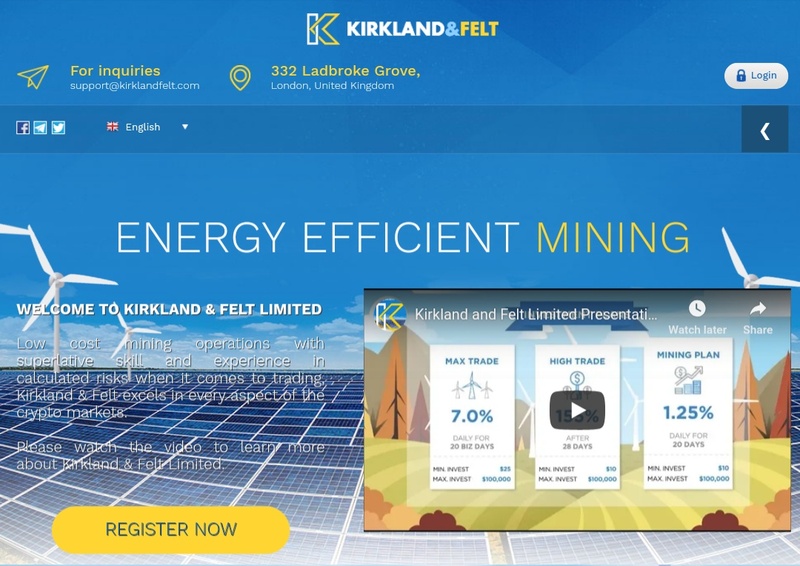 Kirkland and Felt (kirklandfelt.com) is an all in one investment solution which claims to be involved in trading and mining cryptocurrency. The founders of this firm are John Kirkland and William Felt. There is no information on these alleged personalities. Their platform showcase transaction records, but those are all bogus. The returns advertised by them are up to 155% after 28 days. Trading is undoubtedly an exciting way to earn a living. However, it is not possible to sustain these kind of returns. Before they trick you into depositing with them, go through our review wherein we have unraveled all their filthy agendas. All the investment companies indulged with the retail clients have to be regulated. Looking at the way the world of online trading has evolved over the years. It is better to stick with licensed entities, as the number of scams are ever rising. KirkLand & Felt is an ICO. They raise money for trading and mining activities from the general public. In return, the investors are promised certain returns after some time period. We checked their legal aspect. As it turns out, they are not recognized by FCA. So, they are not only unregulated, but also illegal. Their website does not reveal any kind of registration certificate. Seems like, they do not care about featuring relevant details in front of the potential investors. The support team can be contacted through email only. How does KirkLand Felt Work? There is no details about what they will do with the funds raised. In their About Us section, they say that their traders have been around from the 1990’s. Apparently, that is the reason for their success. This narration does not make any sense. We do not have the slightest idea about the indicators they consider or the trading approach they use. They do not feature any information regarding the various aspects of trading like risk diversification and money management. Moreover, the do not showcase any trading history. There isn’t much to talk about mining either. We do not know the location of their data centres or the type of machinery they employ. Basically, there is no credible proof to support any of their claims. Mining and trading are both exciting opportunities which paves way to make reliable income. However, do not mistake it as a shortcut to acquire wealth. Take a look at the plans they advertise, do they look sustainable to you? All ponzi scheme require consistent stream of new participants to stay alive. To grow their profits, these fraudsters offer an affiliate program. They pay attractive incentives to any individual who refers more people to their service. Basically anyone can sign up with them, as they do not care about things like KYC. The commission percentage ranges from 1% to 7%. Operational model of this firm is similar to that of a pyramid scheme. Ultimately, everyone will make money at the expense of the innocent investors. Below we have gathered the statistics of this website with the help of whois.com and alexa.com. Majority of the traffic to this website are coming from Brazil, Iran, India, Pakistan and Turkey. The details of the creators of this firm are untraceable. If they were actually legit, then why are they hesitating to reveal any images of the owners? Moreover, they do not have any credibility boosting factor on their website. A vast majority of the social trading platforms and reputable services offer demo account. The main reason for doing so, is to make the clients confident and allow them to get familiar with the interface. Since this firm does not do that, on what basis will you trust them? Kirkland & Felt is certainly a fraudulent service. There is no way to earn the kind of returns they promise through trading or mining. If you encounter this firm through any of the online forums, then do not engage with them. Since they are a ponzi scheme, they will get shut down sooner or later. Do you have any experience with Kirkland and Felt? Share your story by leaving a comment below. Non fatevi fregare non date un centesimo..
Hello Scambitcoin team! What do you think of trading platform Cap.club? Kirkfelt 2.0 is not paying. Me and two my friends lost some money. Now they have set up a new website 2.1 claiming that they will restore accounts lost by old investors, but 1 month has gone and not payment received yet. Be careful because up to now is SCAM. In case me and my friends will get money back (unfortunately I don’t think will happen…) we’ll let you know, but watch out before giving money to them. This project may pay some early investors but in the medium run it crashes because not sustainable. Me and two my friends are the proof. We lost our money. Why is Kirkland and felt closed for new registrations for now? insomma, non ci ho capito molto, come funziona?…dove bisogna iscriversi per poter depositare e iniziare? does it still pays till today? because my withdrawal has not been approved or successful yet, almost a week already and i’m still waiting. and this time, there’s no way to contact support or if you email them, you don’t know if they are getting it because i get no replies and if i email them through my email account, i get a mailer daemon email message that says the email address doesn’t exist. I’m.having the same issue. My withdrawal request since on Tuesday has not bn approved. I think the site has packed up. I guess I have myself to blame. Despite knowing that it was scam, I wanted to benefit if just for this month. Now I’ve lost $2000. I invested $100,000 initial deposit at KirkFelt and now after 3 months I have already $1 Million in my Savings account! I lost everything. The platform shows everything at zero! Do you have a direct contact to help me recover my money? All our deposit gone. Its almost 2months they dont return our investment. They scam us all. Why does this business give so much profit in a month? Where do the profits you pay us? Io ho conosciuto adesso questo sito e certamente proverò a rischiare qualche centinaio di dollari, non i minimi. E sai perchè? Perchè ho capito che blog come il vostro, che sembrano dedicati a fare il bene delle persone, effettivamente fanno bene solo a se stessi, per conquistare visite e quindi valore, spargendo veleno su tutto e su tutti , basandosi sul fatto che la notizia negativa e di allarme è molto più attraente delle notizie normali e positive. Pla spendibilità della valuta. Per anni sono stato terrorizzato contro la criptovaluta Onecoin : è un ponzi, è uno scam, collassa entro una settimana. Bene Onecoin opera ormai da oltre 200 settimane, ha cambiato la vita di milioni di persone e sta completando il suo ecosistema con un vastissimo e-commerce (dealshaker.com) dove è garantita la spendibilità della criptovaluta ONE. Proprio la settimana scorsa ho acquistato un lussuoso appartamento a Rio de Janeiro. Ci sono decine di modi per avere rendimenti elevatissimi, soprattutto nel campo del forex, delle cripto e della pubblicità, forse è meglio che smettiate di ragionare come ragionieri di fine 900. I tempi sono cambiati. Please sent me your proofs. Do check your email. I have sent you the proofs 4 days ago. Sono completamento d’accordo con te. anche io sono una Onecoiner ,Kirland e molto altro. Credo che per farlo devi avere una formazione, ci sono piattaforme serie che ti aiutano molto e anche gratuitamente,(se siete interessati fatemelo sapere) consiglio inoltre di non farvi raggirare da chi vuole solo confondervi le idee, ricordo che Ponzi e’ stata una grande truffa ma non per questo il Sistema e’ sbagliato. Bitcoin e’ per eccellenza uno schema Ponzi ma guarda un po ora dove e arrivata… e chi ci ha creduto e’ oggi milionario. Ragionate con la vostra testa, conoscenza~ coerenza ti rende libero finanziariamente. Bitte senden Sie mir Ihre Beweise. Kirkland is working well , I m very happy to help many peoples. I opened an account with the company and for sometime now since last week they have been down. As at today I cannot access my account and already an investment of $90 has been placed in the system by me. Please any help will be appreciated my email is [email protected]. Hi, I deposited 3 days ago, and still Not reflected in my activel deposit account. HEATSTREAK Please send me proof that it is paying. Here is my email [email protected]. attention c’est un site arnaque !!!! You do not know?? Many people invest to “Kirklandfelt”, but cannot withdraw money within 24-48 hours. Kirklandfelt are Unbelievable.